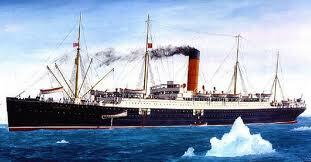 "Why the Titanic sank" by W B Bartlett, she was sailing at 22 knots when the iceberg was detected by lookouts. This was close to her maximum speed. The speed is a controversial issue given that Titanic had received a number of warnings about ice. However, the myth that some attempt was being made on the transatlantic crossing record can be safely discounted particularly given that there were already faster passenger ships sailing the Atlantic. On seeing the iceberg, the lookouts warned the bridge and certain avoiding action was ordered. However, this was ineffective and the result was that the starboard side of the ship scraped along the iceberg. 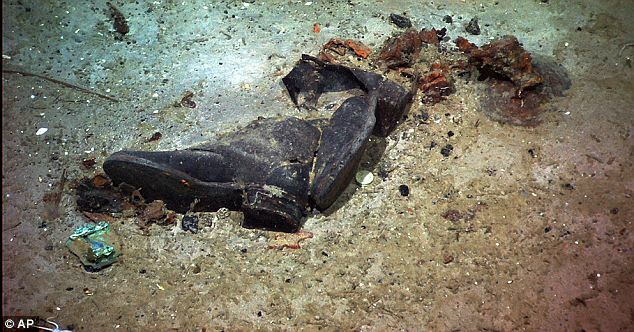 The Wikipedia entry RMS Titanic states that - "The glancing collision caused Titanic's hull plates to buckle inwards in a number of locations on her starboard side and opened five of her sixteen watertight compartments to the sea. Over the next two and a half hours, the ship gradually filled with water and sank." "Two hours and forty minutes after Titanic struck the iceberg, her rate of sinking suddenly increased as her forward deck dipped underwater and the sea poured in through open hatches and grates. As her unsupported stern rose out of the water, exposing the propellers, the ship split apart between the third and fourth funnels due to the immense strain on the keel. The stern remained afloat for a few minutes longer, rising to a nearly vertical angle with hundreds of people still clinging to it. At 2.20 am, it sank, breaking loose from the bow section." 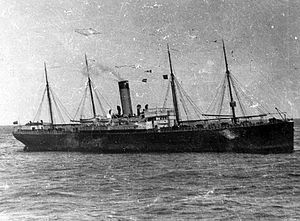 The official British Inquiry concluded that another ship - SS Californian - had seen white rockets from Titanic but had failed to go to her assistance. The Californian's captain (Stanley Lord) was much vilified as a result of this finding of fact. (The evidence available indicates that titanic fired 8 "white" rockets over a period of about an hour and they were fired at irregular intervals whereas rules at the time for distress signals required firing at "short intervals" - see here). The British Inquiry's comments on the Californian are available here and some analysis of the navigation of the Californian is here. There are certainly those who consider that Captain Lord was unfairly treated by the British Inquiry. It seems unlikely that the controversies surrounding Californian will ever be satisfactorily resolved. The focus on Captain Lord's actions was, in any event, something of a distraction when the real causes of much loss of the loss of life was (a) the speed in an area where ice had been reported and (b) problems with Titanic's lifeboat provision and the absence of lifeboat drill. There were lifeboats which were not launched by the time Titanic sank and, of those launched, some were not full. In 1912, it was not unusual for ships to sail without lifeboat capacity for all on board and regulations lagged well behind the increased size of vessels (Bartlett - Why the Titanic sank - Chapter 6). At around 4 am, RMS Carpathia - under the command of Captain Arthur Rostron (1869-1940) - arrived on the scene in response to Titanic's earlier radio distress calls. (Jack Phillips, one of RMS Titanic's radio operators, remained at his post sending distress messages until minutes before the ship sank. He lost his life. The distress signal at the time was CQD - SOS came later). 710 people survived the disaster and were conveyed by Carpathia to New York. The disaster was greeted with worldwide shock and outrage at the huge loss of life and the regulatory and operational failures that had led to it. Official inquiries into the sinking were held in the USA and in England. The inquiry reports are available on the Titanic Inquiry Project website. See also the US Senate report and the British report. The recommendations made by the British Inquiry - chaired by Lord Mersey (1840-1929) - are here. 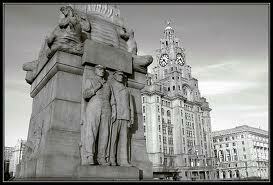 (Mersey had, briefly, been President of the High Court's Probate, Divorce and Admiralty Division - "Wills, Wives and Wrecks" - which survived until the Administration of Justice Act 1970). An important legacy of these inquiries was the International Convention for the Safety of Life at Sea (SOLAS), which still governs maritime safety. Other recommendations led to changes in maritime regulations to implement new safety measures such as ensuring that more lifeboats were provided, that lifeboat drills were properly carried out and that wireless equipment on passenger ships was manned around the clock. (In 1912, Wireless Telegraphy was still in its infancy and was used on the Titanic more as a service for passengers who wished to send and receive personal messages). An International Ice Patrol was set up to monitor the presence of icebergs in the North Atlantic, and maritime safety regulations were harmonised internationally through the International Convention for the Safety of Life at Sea; both measures are still in force today. The International Maritime Organisation's website has much detail about safety measures at sea. Despite the undoubted improvements in maritime safety, there can be no place for complacency in an environment as unforgiving as the sea. The marine environment is one of constant change. Furthermore, there are new developments in ship design and equipment. As vessels age, further safety risks arise. For example, the oil-tanker Erika sank in 1999 off the coast of Brittany. A contributory factor in breaking up of the ship was widespread corrosion. (See item on UK Human Rights blog and also see Europa Erika Package I). Then there are human factors and the danger of over confidence leading to the taking of unnecessary risk. In aviation, over the last 20 years, there has been increasing emphasis on the considerable role which human factors play in safety - see, for example, IATA Training Portfolio. The Civil Aviation Authority's website has a specific section relating to Human Factors. In relation to the training and certification of seafarers - see "International Convention on standards of training, certification and watchkeeping for seafarers" (STCW Convention) and the Merchant Shipping (Training and Certification) Regulations 1997 (original version here - there are amendments). Tragedies have continued to occur. The Herald of Free Enterprise in March 1987 at Zeebrugge was, according to the Sheen Inquiry, caused by failure to close the bow doors on the "roll-on roll-off" ferry. Here, human factors, played a considerable part in that unsafe methods of working were adopted and accepted as normal operating practice. In October 1987, a coroner's inquest jury into the capsizing returned verdicts of unlawful killing. Seven individuals involved at the company were charged with gross negligence manslaughter, and the operating company, P & O European Ferries (Dover) Ltd, was charged with corporate manslaughter, but the case collapsed after Turner J directed the jury to acquit the company and the five most senior individual defendants. The trial highlighted the problems involved in prosecutions at common law for corporate manslaughter. The Corporate Manslaughter and Corporate Homicide Act 2007 was eventually enacted as a response to this and other cases. More recently, the Costa Concordia accident occurred on 13th January 2012 when the ship struck rock off Isola del Giglio, Italy. This accident remains under investigation. 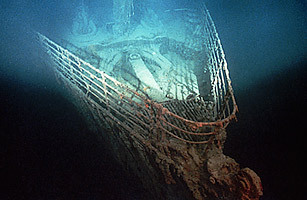 Research into the RMS Titanic disaster yields a very large number of sources of information. Many of these links are set out on the Additional Links companion to this blog. Oh, hear us when we cry to Thee, For those in peril on the sea!"